S Jain, B Banerjee. Silastic flexible hinge implant arthroplasty of the great toe for hallux rigidus: A retrospective analysis. The Internet Journal of Orthopedic Surgery. 2007 Volume 9 Number 2. The outcomes in 65 patients with 76-silastic flexible hinge (two-stem) metatarsophalangeal joint implant arthroplasty for hallux rigidus were studied retrospectively. The mean age of patients at the time of surgery was 56 years (26-86) and mean follow-up was 6 years (2-11). Overall success rate on subjective assessment was 80%. Fifty-five (85%) patients reported good pain relief after the operation. Average AOFAS score improved from 30 (range 20-40) before the operation to 70 (range 60-80) at one year after the operation. Although follow-up radiographs demonstrated variable amounts of lysis around 10% of the silastic implants (8 patients), this deterioration did not correlate with reduction in patient satisfaction. Therefore silastic metatarsophalangeal joint arthroplasty should still be considered as an option in selected patients with end-stage hallux rigidus where other total joint arthroplasty or arthrodesis is not feasible. Arthrodesis is still the preferred treatment for end-stage hallux rigidus in young and active patients. Silicone implant arthroplasty of the great toe was first described by Swanson et al in 1979(10). Over the years however, it has fallen into disrepute due to conflicting reports of silicone-related synovitis and bone lysis (2,10). This has led to other forms of total joint replacement becoming more popular. The objective of this retrospective study was to analyse medium to long-term clinical outcomes and satisfaction of patients with silastic flexible hinge (two-stem) implant arthroplasty of the great toe metatarsophalangeal joint. Sixty-five patients who underwent a silastic flexible hinge implant arthroplasty (Wright Medical Technology, Inc.) of the first metatarsophalangeal joint for hallux rigidus between May 1996 and December 2004 were evaluated retrospectively. A total of 76 silastic prostheses were implanted (54 unilateral and 11 bilateral). The group comprised 25 males and 40 females with an average age 56 years (26-86). Co-morbidities included non-insulin dependent diabetes (three patients), hypertension (three patients) and moderately severe rheumatoid arthritis (three patients). Most of the patients in our study group were within average BMI range (20-25). All the patients in the working age group were in predominantly sedentary jobs, as those doing manual work were advised against this procedure. Twelve patients (18%) had had previous chevron osteotomy with bunionectomy for hallux valgus. All patients completed satisfaction questionnaire, VAS and (American Orthopaedic & Ankle Society Score) AOFAS pre-operatively. Surgeons of similar seniority and experience performed the operations, and most of the cases were operated as day-case procedures. The procedures were all performed through a dorso-medial incision under tourniquet control. Bunionectomy, cheilectomy and medial capsular reefing were carried out in all the cases. Titanium grommets (collars) were used in 40 (52%) cases. Postoperatively, all patients were advised to remain non-weight bearing for the first 2 weeks until the sutures were removed. They were then put in a plaster shoe for a further 4 weeks and were allowed “heel-walking” only. After 6 weeks, they were allowed unprotected weight bearing and normal shoes. All patients were then routinely followed up at 6 months, 12 months and yearly thereafter, with radiographs at each visit. The average time of follow-up was 6 years (2-11). At final follow up we repeated assessment of overall subjective satisfaction, Visual Analogue Scale (VAS) for pain, and AOFAS. We also graded the radiological appearance at final follow-up, in terms of great toe alignment; implant position and peri-prosthetic bone lysis. Overall success rate on subjective assessment was 80%. Fifty-five (85%) patients reported good pain relief after the operation with an average Visual Analogue Scale of 2.5 (range 0-5) as compared to pre-operative average score of 5.5 (range 4-7), which was found to be statistically significant (p < 0.001). All patients experienced a subjective improvement in range of movement in the joint. Post-operatively, the average flexion was 11° (range 5-20°) and extension 20° (range 10-30°). Although none of the patients reported difficulty in walking or slow running, most patients reported limitation of recreational activities. The average AOFAS score improved from 30 (range 20-40) before the operation to 70 (range 60-80) at 1 year after the operation (p=0.0001). The scores remained unchanged thereafter. The radiographs were deemed satisfactory if they showed full correction of the deformity; good implant position and no intra-operative fractures. The postoperative radiograph was satisfactory in 46 (70%) patients. Although follow-up radiographs demonstrated variable amounts of lysis (fig 1) around 10% of the silastic implants (8 patients), this deterioration did not correlate with reduction in patient satisfaction. 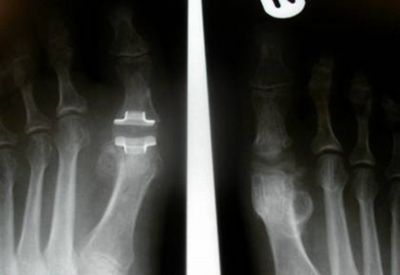 Figure 1: Radiograph three years after bilateral silastic big toe joint replacement. The right side prosthesis, without grommet, shows early features of lysis. Titanium grommets (collars) were used in 40 (52%) cases. In 2 patients (3%) with bilateral first metatarsophalangeal joint replacements, a grommet was used only on one side. In both these cases, there were features of early lysis around the implant on the side without the grommet. This is thought to occur due to the sharp bone edges rubbing against the implant in absence of protective titanium grommet. However, there was no difference in AOFAS scores, VAS for pain and range of movement in the two groups. Six patients (9%) complained of persisting mild to moderate pain and swelling in the joint. Two patients (3%) felt that the operation had not adequately corrected the great toe deformity (fig 2), but they were satisfied with their improved level of function. All the above 8 patients declined to have the joint arthrodesed. Two patients (3%) had deep infection requiring implant removal. 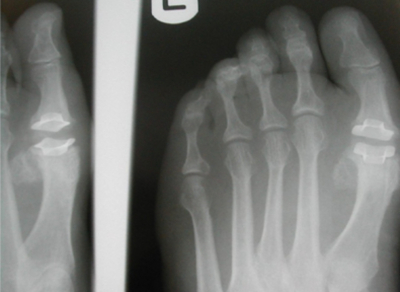 Figure 2: Radiograph two years after silastic joint replacement showing persisting hallux valgus deformity. Arthrodesis is still the preferred treatment for end-stage hallux rigidus in young and active patients. Silicone implant arthroplasty of the great toe was first described in 1979 by Swanson et al (10). Silastic first metatarsophalangeal joint replacement is an accepted treatment for hallux rigidus, which not only provides long- term pain relief but also satisfactory range of movement. In our series, most patients reported good pain relief at 6 months after the operation, and improved function in activities of daily living and work. All patients reported no difficulty in walking or slow running although there was some limitation of recreational activity. Granberry et al (2) in 1991 reviewed 90 patients with flexible hinged silicone big-toe prosthesis. They reported good pain relief after the procedure with satisfactory range of big-toe movements. Nevertheless, they noted mechanical failure of some implants, and their pedobarographic analysis of the distribution of plantar pressures revealed that none of the patients exerted weight-bearing pressures on the affected great toe. However in our series none of the patients reported any change in gait or uneven shoe wear or transfer metatarsalgia. Pfeiffer et al (6) in 1992 reported their results in a 44-patient series. The pain, walking, and function scores all improved, with greatest improvement being pain relief. These results correlate with our series. Hetherington et al (4) in 1993 described similar good functional results to Granberry et al (2). Moreover, they also reported some cases of implant migration and fracture, which we did not observe in our series. Sebold et al (7) in 1996 stressed the importance of the use of titanium grommets (collar) as they protect the silicone implant and may help provide a longer life for the silicone implant. Lemon et al (5) in 1997 described a study of 50 cases of silastic implants, and they stressed the importance of realigning the joint via appropriate osteotomies and proper soft tissue balancing for better outcomes. A review by Bonet et al (1) in 1998 suggests that implants can be effective when used with carefully selected patients. Smetana et al (9) in 2003 looked at 15-year outcomes after the use of a silicone metatarsophalangeal joint implant in hallux rigidus. They found favourable subjective assessments by the patients, and a low number of failed implants. They therefore concluded that this technique is appropriate for the middle-aged patients with hallux rigidus, even though it may not permit a large range of motion in the operated joint. Although the postoperative range movement of the MTP joint was not very high in our series (average flexion 11° and extension 20°), none of the patients reported difficulty in walking or slow running. Single-stemmed silastic MTP arthroplasties have been abandoned in many centres because of short-term complications, and have been superseded by hinged implants. Shankar et al (8) described poor results of single-stemmed silastic implants in 1995. He studied forty patients over 110 months and found 36% failure rate. Most of the failure was attributed to the fragmentation of the implant discovered at the time of removal. Harrison et al (3) in 2003 reviewed 21 single-stemmed silastic implant arthroplasties in 18 patients. The mean follow-up was 18years, nine months. Two patients had their implants removed at between two to three years, one due to swelling from silicone synovitis or infection. The authors stated that there was no correlation between radiographic grading and preoperative diagnosis, clinical score of duration of implantation, and that the erosive bone changes and subsequent loss of bone stock did not appear to cause clinical detriment. In their long-term review outcomes were surprisingly good, particularly in the surgical treatment of hallux rigidus in the over fifty age group. We conclude that silastic flexible hinge (two-stem) first metatarsophalangeal joint replacement is an effective treatment for end stage hallux rigidus, which not only provides long- term pain relief but also a satisfactory range of movement. Therefore it should still be considered as an option in selected older patients where other total joint replacement or arthrodesis is not feasible. We recommend a long-term large multicentre study to evaluate this further. 2. Granberry WM, Noble PC, Bishop JO, Tullos HS. Use of hinged silicone prosthesis for replacement arthroplasty of the first metatarsophalangeal joint. J Bone Joint Surg 1991; 73-A: 1453-1459. 3. Harrison WJ, Loughead JM. Silastic MTP joint arthroplasty: very long-term results of single stem implants in degenerative joint disease. Journal of Bone and Joint Surgery (Br), Vol 85-B, Issue SUPP_III, 248. 4. Hetherington VJ, Mercado C, Karloc L, Grillo J. Silicone implant arthroplasty: a retrospective analysis. J Foot Ankle Surg. 1993; 32: 430-433. 6. Pfeiffer WH, Cracchiolo A 3rd, Grace DL, Dorey FJ, Van Dyke E. Double-stem silicone implant arthroplasty of all metatarsophalangeal joints in patients with rheumatoid arthritis. Semin Arthroplasty. 1992; 3: 16-24. 7. Sebold EJ, Cracchiolo A 3rd. Use of titanium grommets in silicone implant arthroplasty of the hallux metatarsophalangeal joint. Foot Ankle Int. 1996; 17: 145-151. 8. Shankar NS. Silastic single-stem implants in the treatment of hallux rigidus. Foot Ankle Int.1995 Aug; 16 (8): 487-91. 9. Smetana M, Vencalkova S. Use of a silicone metatarsophalangeal joint endoprosthesis in hallux rigidus over a 15-year period. Acta Chir Traumatol Cech. 2003; 70: 177-181.